I’ve been on a family vacation to the Corpus Christi, Texas area this week. It’s been a great week, with pleasant weather and lots of beach exploration. I’ll have more photos to share next week, but today wanted to share a plant that I very much enjoyed photographing down here. 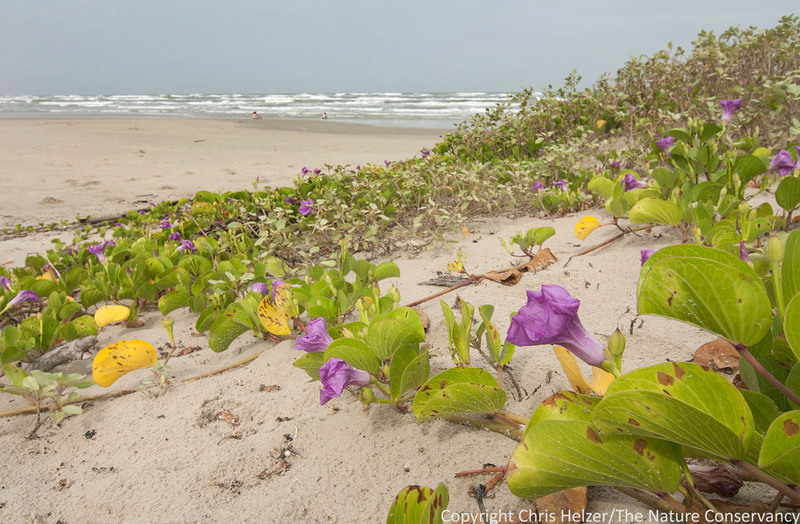 Railroad vine in bloom at Padre Island National Seashore, Texas. Railroad vine, or beach morning glory (Ipomoea pes-caprae) is a native vine that sprawls across many of the dunes along the beaches of the Gulf Coast of Texas. Although it is in the same plant family as the bindweed I’m fighting in my home garden, it wasn’t hard to appreciate its color and character. We spent Thursday at San Jose Island, just north of Port Aransas, Texas. Railroad vine was common on the beach dunes there as well. Also abundant on those dunes were grasshoppers of many colorful species. The two interacted in at least some cases, with the grasshoppers feeding on the flowers of the vine. Grasshopper feeding on railroad vine flowers. San Jose Island, Texas. 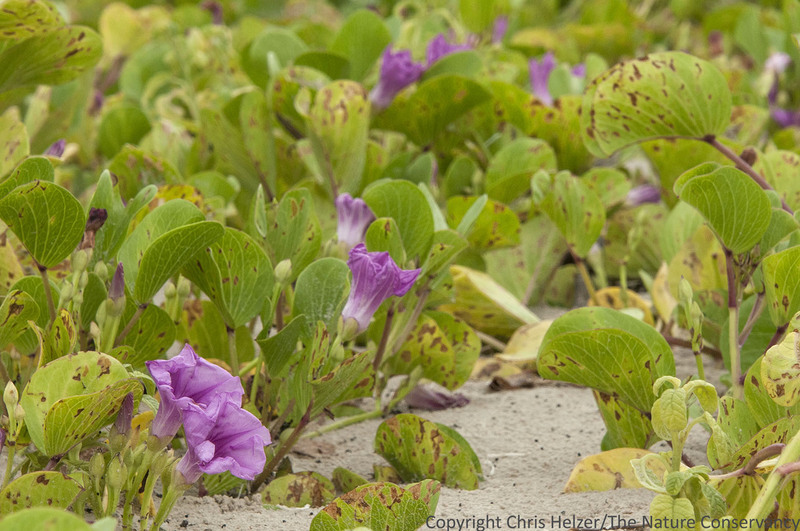 This entry was posted in Prairie Insects, Prairie Natural History, Prairie Photography, Prairie Plants and tagged beach, beach morning glory, corpus christi, dune, flowers, grasshopper, gulf coast, gulf of mexico, Ipomoea pes-caprae, port aransas, railroad vine, san jose island, texas by Chris Helzer. Bookmark the permalink. The ³portrait² of the grasshopper looking out of the blossom, all covered with pollen, is fabulous! Thanks! 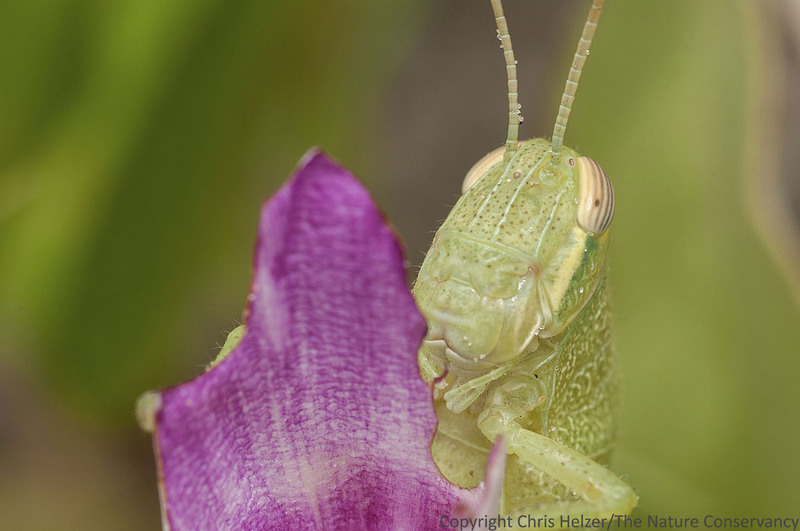 Does that mean that grasshoppers can be pollinators? They can, but it’s basically accidental. James beat me to it. 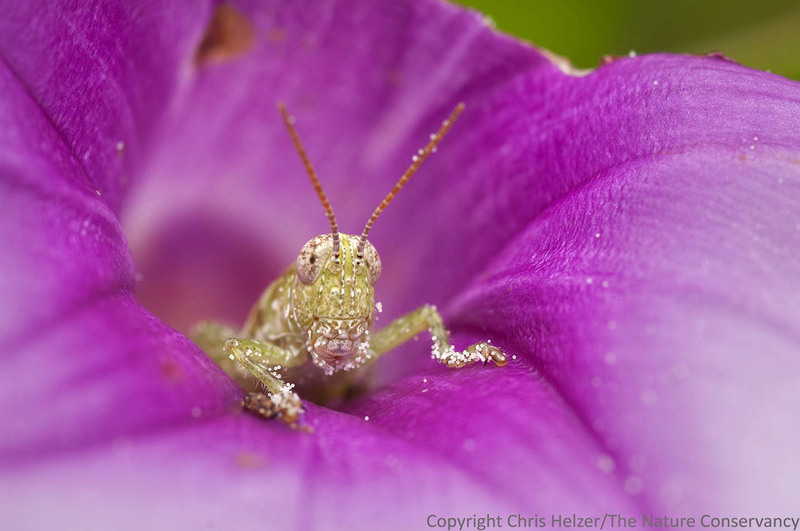 Yes, they can move pollen around, but they’re more likely to eat the flower than pollinate it. They’re not built for pollination (not fuzzy, for example) and don’t have the behavior (e.g., visitation of many flowers consecutively) either. Thanks to both of you. A friend in New Mexico put her chickens out around a commercial cut flower crop and the chickens solved the problem of a grasshopper invasion. They preferred grasshoppers to flowers. surfs up on the Prairie. Very unusual, but quite lovely. Have a great time. Great place to vacation! Love the grasshopper shot, too! Have Fun. Be careful in the dunes; my father was struck by a rattlesnake in a Galveston Island dune. He recovered fine. Maybe you and your family can check out the baby Kemp/Ridley turtle release! My homelands! We were there in May, unfortunately at the height of the floods, so the beach was basically a mudpit with lots of fetid standing water and mosquitoes having a major party. Great shots!